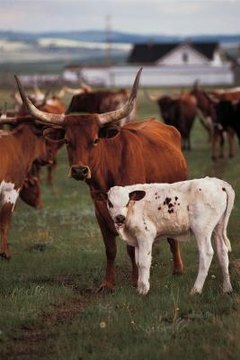 It is crucial that your young calves receive sufficient nutrients from their mothers. Calves who cannot get enough milk from their cows may fail to grow properly or suffer from health problems as a result of a lack of nutrients. As a cow owner, it is your job to ensure your cow gets enough to eat so that she can produce adequate milk for her calf. The average lactating cow produces a normal amount of milk, approximately 6.5 gallons of milk per day. The average cow will produce enough milk to care for her calf adequately but she will need to receive enough feed to do so. The University of Kentucky recommends that a lactating cow with average milk production be given either free access or a high-quality pasture or a diet that consists of 25 lbs of hay daily. Alternate daily feed programs include giving your cow 65 lbs of corn silage in addition to 1 lb of a protein supplement or providing 55 lbs corn silage in addition to 5 lbs alfalfa hay. Corn silage is used to provide nutrition for cows when quality hay is not available. The University of Kentucky recommends feeding your heavily lactating cow, who produces more milk than your average cow, a more nutritious diet than the average cow. You can give your heavily lactating cow free access to a high-quality pasture or 30 lbs of grass-legume hay every day. If your cow needs additional weight or is not holding her body condition the way you want her to, you can supplement with several pounds of livestock grain if desired. If hay is not available you can either feed 60 lbs of corn silage in addition to a 2.5-lb protein supplement or 50 lbs of corn silage and 10 lbs of high quality alfalfa hay. Creep feeding is the process of giving the calf additional grain to supplement his nutrition. Once your calf is 90 days old, he will require additional nutrition other than what is provided by his mother's milk. The best option is to turn both your cow and the calf loose on a high-quality pasture and allow them to graze as desired. If this is not possible, you should provide your calf with no more than 1.5 lbs of grain each day. Pregnant and nursing cows often struggle with mineral deficiencies as a result of an unbalanced diet or a lack of vitamin and mineral supplements. You need to provide your cows with a vitamin A supplement, as well as a mineral mixture added to the daily feed ration.